Hello all! I’m Sheila B Robinson, aea365’s Lead Curator and sometimes Saturday contributor with a Hot Tip and Rad Resource for presentation designers! On the p2i HOME page, you’ll find a brief introduction to p2i, and our 3 key components – Message, Design, and Delivery. Webinars for each provide in-depth learning and reference some of the resources found on the PRESENTATION TOOLS & GUIDELINES page. All downloadable resources live on the PRESENTATION TOOLS & GUIDELINES page. The page is organized with Checklists & Worksheets on top, then resources aligned to the p2i components – Message, Design, and Delivery – followed by resources for Audience Engagement. As you browse this page, you’ll find links to additional content and pages along with the tools. Just look for tool titles that are links, as in this example: Notice that “Slide Design Guidelines” is a link. This will take you to another page of content on Slide Design. Another key addition is that the authors who contributed the content are now recognized and their names linked to their websites or LinkedIn profiles. Given that posters are the largest category of presentations at our annual conference, POSTER PRESENTATIONS warranted its own page. Here, you’ll find a page with specific guidelines for designing a conference poster, along with two additional navigation buttons. One takes you to more content on Research Poster Design, while the other points to Award Winning Posters, from recent AEA conferences, and other organizations. Each poster image is accompanied by a brief explanation of what makes it a winner. Don’t forget to visit the ABOUT US page to learn about the folks who have contributed to making p2i what it is! We now have a hashtag that is all ours: #aeap2i. Please tweet about the p2i website and resources using this tag. 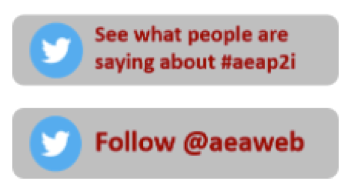 Follow the hashtag #aeap2i by clicking on the top button found on the p2i HOME page, and while you’re at it, why not follow the association itself (@aeaweb) as well! Over the last year, we’ve worked to migrate and reorganize all content from the original p2i website to the main AEA site at eval.org (kudos to Zachary Grays, who did the heavy lifting!). We updated the tools, and added new content and introductory language where needed. One reason for the move was to protect us from hackers. Our original site, built on a different platform, was a constant target and over the years we received countless notices from members that the site URL had been maliciously redirected (meaning it took people to a different website), or that downloads were not working. We’re confident now the new site and all of our great content will be safe and reliable. Be sure to visit eval.org/p2i and let us know what you think! Sneak Preview! We have exciting new content for our p2i resource collection on its way to publication. Stay tuned to learn more!